Looking towards a homestead with grass and sections of gardens in the foreground and a large byre (luak) visible to the left. Three huts belonging to the household are visible to the right. The film number suggests a location among the Gaajok. 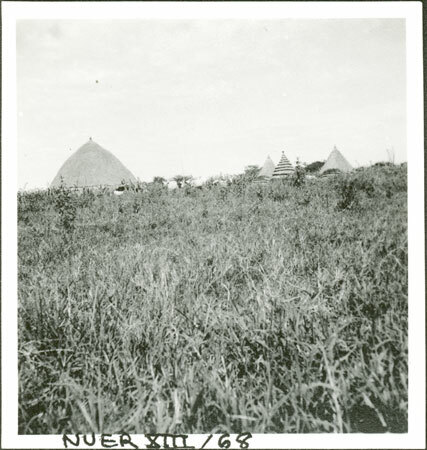 Evans-Pritchard spent some 4 weeks in June/July 1935 at Mancom village near the mouth of the Nyanding River among the Eastern Jikany tribes. The lush vegetation surrounding the homestead gives an indication of the changed grazing environment during the rains. Note on print reverse ms pencil - "40 1" & print front border ms ink - "NUER XIII/68"
Morton, Chris. "Nuer homestead" Southern Sudan Project (in development). 03 Jan. 2006. Pitt Rivers Museum. <http://southernsudan.prm.ox.ac.uk/details/1998.355.634.2/>.